Lightning strike testing has been performed for the A350 XWB, completing a key required step in preparations for this next-generation Airbus jetliner’s maiden flight. 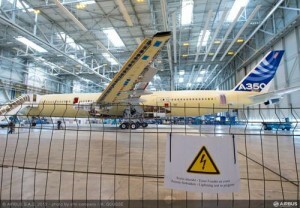 These so-called “electromagnetic hazard” evaluations – which took place mid-month at Airbus’ Clément Ader facility in Colomiers, France – involved the second A350 XWB flight test aircraft, MSN3, to demonstrate necessary protection levels in case of lightning strikes while aloft.The A350 XWB’s aerostructure is made primarily of composite materials (carbon fibre reinforced plastic), providing more electrical resistance than an aerostructure consisting mostly of metallics.To ensure the A350 XWB aerostructure safely manages lightning strikes, Airbus developed a solution where metallic foils are embedded in the aircraft’s composite panels – increasing the aerostructure’s electrical conductivity and protecting harnesses with metallic conduits.Metallic foils already have been used on the A380 rear fuselage section, however as the A350 XWB includes a higher percentage of composite materials, it is important to confirm that such foils provide adequate protection for systems and equipment.The A350 XWB “electromagnetic hazard” testing on MSN3 lasted around three days, consisting of lightning strike simulations and follow-up measurements of induced voltage/current levels on selected harnesses. These evaluations use a low-level current injection rather than the actual electrical current level generated by a lightning strike, with the measured voltages and current then extrapolated to the real threat of 200,000 amperes. This testing will be continued by similar but longer tests on the MSN4 aircraft in 2014, fulfilling a requirement for type certification of Airbus’ A350-900 version.